We are promoting research and development with the aim of launching the Shinshu-made Visible Optical Communication Experiment Satellite together with students and regional companies. 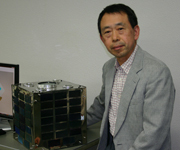 In 2013, Shinshu University’s “Visible Optical Communication Experiment Satellite”was launched by a H-II A rocket as a piggyback sub-satellite of a large satellite GPM, which was jointly developed by the Japan Aerospace Exploration Agency (JAXA) and the Aeronautics and Space Administration (NASA), and it will conduct experiments on bidirectional data communication between the ground and space. 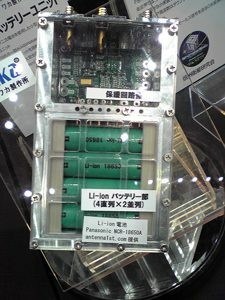 Lithium-ion batteries are planned to be used as a satellite power supply (battery). Thanks to antenna1st’s response, we were able to proceed with the test as planned. I think that the development of the satellite comes with difficulties, but we thank you for your continued support of the Shinshu University Satellite Project in the future. Visible Optical Communication Experiment Satellite ShindaiSat “Ginrei” was launched from the Tanegashima Space Center on a H-II A rocket 23 at 3:37am on February 28, 2014. “Ginrei” was introduced to the Earth’s orbit around 400km altitude in 24 minutes and 17 seconds after the launch, and it was operated without any problem for about 9 months until November 24, 2014.